Schwartz & Wade, 9780375836183, 200pp. The award-winning author of Ben Franklin’s Almanac and Our Eleanor has created an enthralling joint biography of our greatest president, Abraham Lincoln, and his complex wife—a scrapbook history that uses photographs, letters, engravings, and even cartoons, along with a fascinating text, to form an enthralling museum on the page. 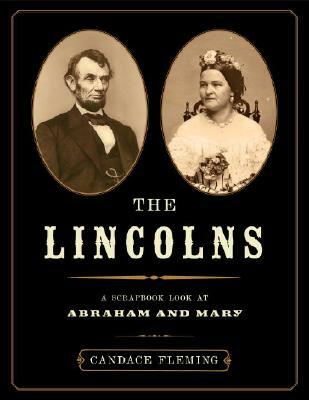 The Lincolns received four starred reviews and won the Boston Globe–Horn Book Award for Non-Fiction, making this the perfect addition to any collection. Here are the extraordinary lives of Abraham and Mary, from their disparate childhoods and tumultuous courtship, through the agony of the Civil War, to the loss of three of their children, and finally their own tragic deaths. Readers can find Mary’s recipe for Abraham’s favorite cake—and bake it themselves; hear what Abraham looked like as a toddler; see a photo of the Lincolns’ dog; discover that the Lincoln children kept goats at the White House; see the Emancipation Proclamation written in Lincoln’ s own hand. Perfect for reluctant readers as well as history lovers, The Lincolns provides a living breathing portrait of a man, a woman, and a country. Candace Fleming is the prolific author of many critically acclaimed, bestselling books for children. She lives in Oak Park, Illinois. "The scrapbook technique . . . remains fresh and lively, a great way to provide a huge amount of information in a format that invites both browsing and in-depth study." "Fleming offers another standout biographical title, this time twining accounts of two lives—Abraham and Mary Todd Lincoln—into one fascinating whole." "It's hard to imagine a more engaging or well-told biography of the Lincolns." "Fleming is able to compare and contrast the president with his first lady, giving us not only greater insight into each of them but also a fuller picture of the world in which they lived." "The format of 'The Lincolns' may be aimed at young readers, but, given Candace Fleming's unerring eye for the dramatic quotation (with the Lincolns, there were a lot of those), this birth-to-death biography of Mary and Abraham is hard to put down even for readers who know the story." "This dual biography is hard to put down, even if you know the story."